While the seats are packed, it’s pretty quiet here in the Law Library, as students are taking full advantage of the Reading Period to prepare for final exams. 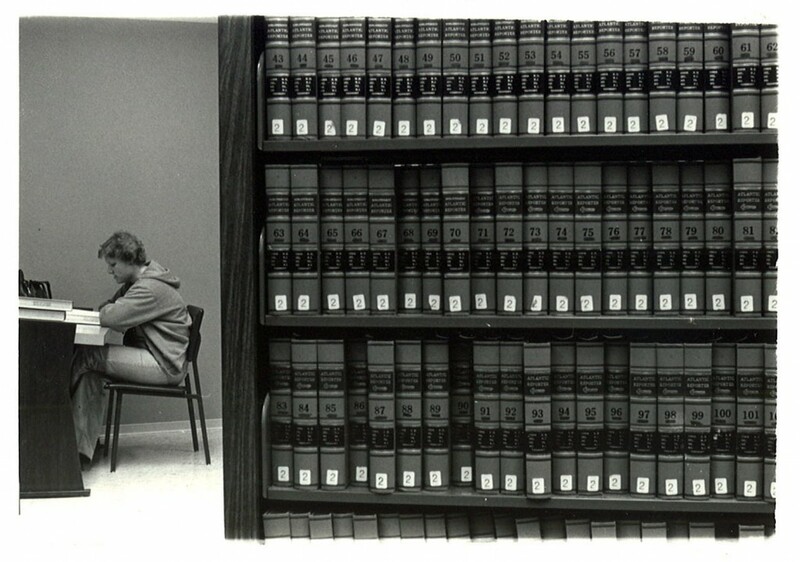 Law students have long taken refuge in the library for quiet study. 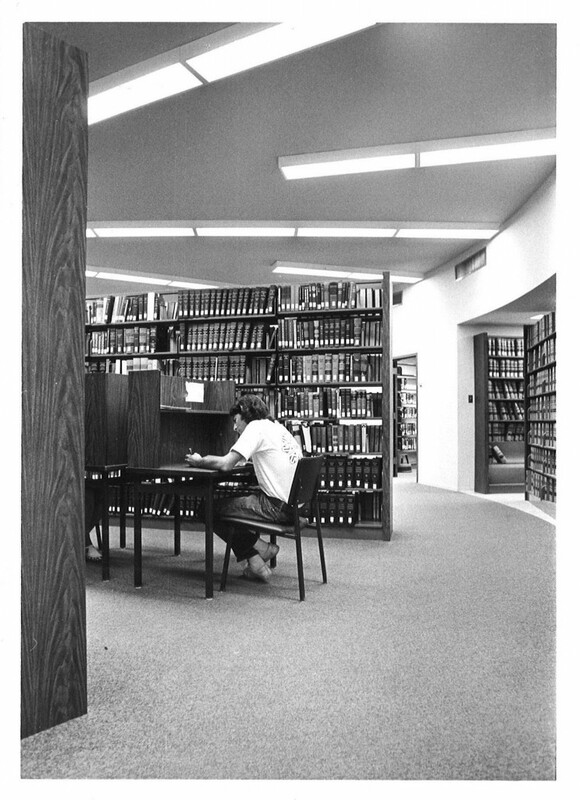 Before 1993, the ASU Law Library was housed in the basement and other areas of Armstrong Hall. Without a free-standing building with dedicated study rooms (which, by the way, are in high demand this time of year – reservations are recommended! ), students hunkered down at study carrells or nooks and crannies throughout the space. 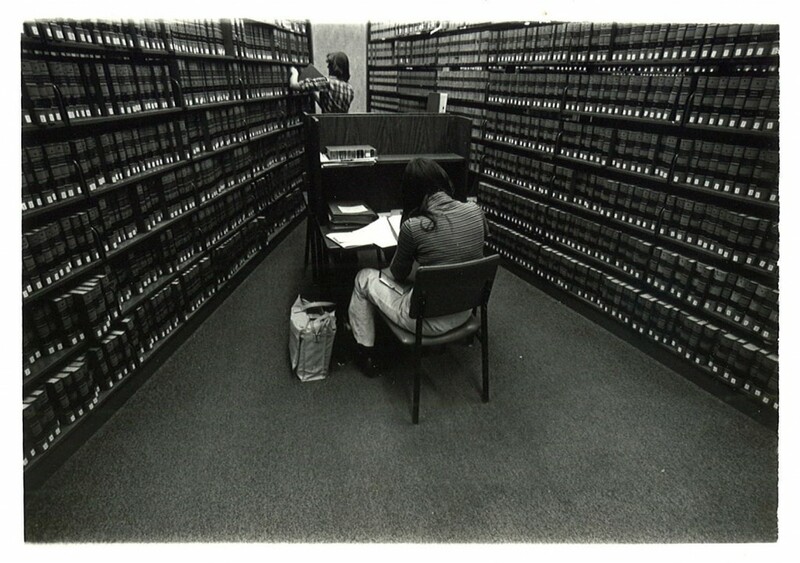 To commemorate this Reading Period, we thought you’d enjoy these photos of hard-working law student of yore (c.1970s). Hang in there, students, soon final exams will be a thing of the past! This entry was posted in Law Students, Uncategorized on April 24, 2013 by Sara Lipich. The Ross-Blakley Law Library at the Sandra O’Connor College of Law is pleased to announce the inaugural recipients of the Ross-Blakley Law Library Award for Exemplary Student Research. Lily Yan is the first place award recipient for her paper Uncharted Domains and the New Land Rush: Indigenous Rights to Top-Level Domains, while Tim Forsman earned second-place honors for What the QSA Means for the Salton Sea: California’s Big Blank Check. Yan and Forsman’s papers demonstrate sophistication and originality in the use of research materials, exceptional innovation in research strategy, and skillful synthesis of research results into a comprehensive scholarly analysis. A review panel comprised of librarians Victoria Trotta and Beth DiFelice and Associate Clinical Professor Kimberly Holst selected the winners from the competitive entries. In addition to receiving a monetary award, the winners are also invited to publish their papers in Law Library’s digital scholarship repository, and to feature their papers in the Law Library Display Case. This entry was posted in Law Students on April 19, 2013 by Leslie Pardo. Group Study Room reservation times will be extended during the exam period, April 19-May 7, 2013. You may reserve rooms up to one week in advance. Reserved rooms will be held for 15 minutes. Please stop by the Law Library Circulation desk to reserve a room or use our online study room reservation system. Groups are limited to the maximum reservation time per day. Reservations may not be made under multiple group members’ names in order to extend use of a study room beyond the maximum time. Consecutive reservations made for members of the same group will be cancelled. 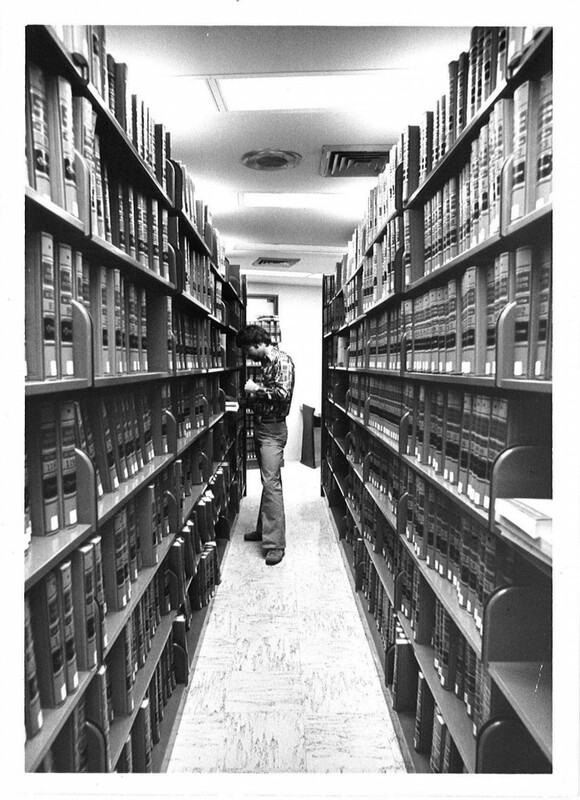 This entry was posted in Law Library Services, Law Students on April 18, 2013 by Carrie Henteleff. While searching the College of Law Archives for items to include in Professor Feller’s upcoming memorial service, I came across a gem in the Spring 1989 Forum (a former periodic publication of the College of Law): The Commencement Address, given by Paul F. Eckstein, to the graduating class of 1988. Good speeches stand the test of time, and 25 years later, Eckstein’s advice is still solid. To read the Commencement Address in its entirety, click here. This entry was posted in Uncategorized on April 17, 2013 by Sara Lipich. 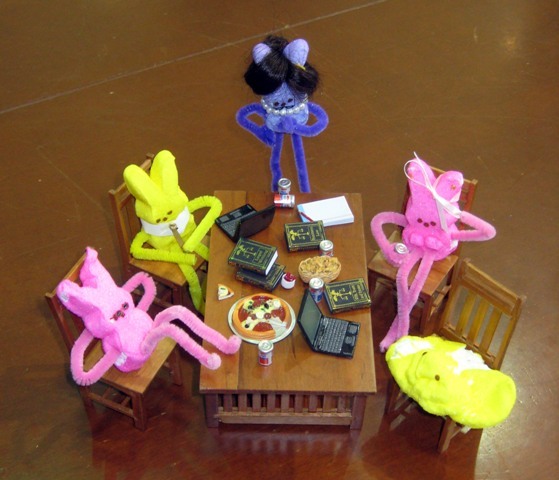 In 2009 the Law Library won the ABA Journal’s Peeps in Law contest for our 1L Peeps Study Group. Our winning entry is below. The Law Library staff wishes you luck studying for your finals. A diligent group of law student peeps study for their upcoming final exams in the Arizona State University Ross-Blakley Library. All are wannapeep Peep Masons and Ally McPeeps. They are studying hard, hoping to learn it all before their brains turn to marshmallow. Alas, too late for 1L C. Little – he has had a meltdown! Since the law librarian is watchful, and the 1Ls are courteous library citizens, they are using their best inside peep cheeps. This entry was posted in Humor on April 15, 2013 by Leslie Pardo.